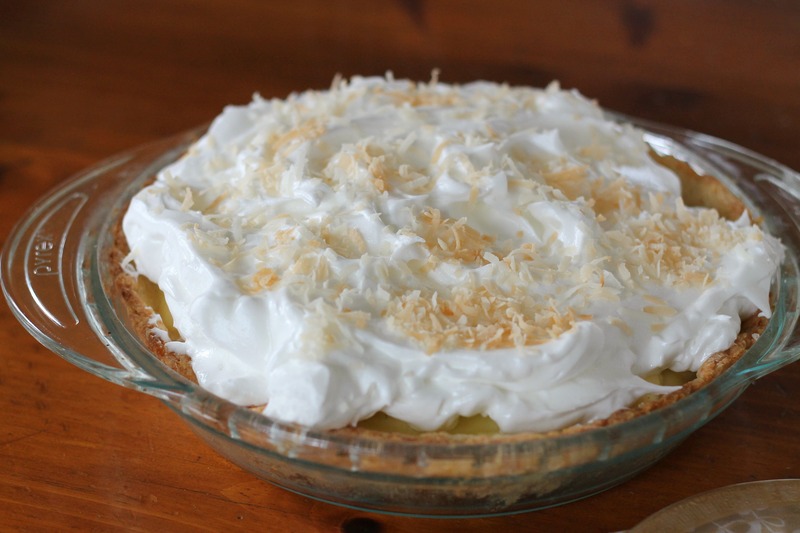 Right now, you are looking at one of the best pies ever: coconut cream pie. All pies are good, especially cream ones, but this one really takes the cake (or pie…) in our opinion. Honestly, how can you say no to a crispy, buttery crust filled with an addictive coconut- vanilla bean filling, a cloud of meringue, and some freshly toasted coconut? The answer is that you can’t unless you really hate coconut. Most cream pies are topped with whipped cream, which is not a bad thing. However, we prefer that this pie is topped with a fluffy meringue for a couple of reasons. The first is that it just tastes great with the creamy filling! The second is that while a pile of whipped cream is yummy, it’s extremely rich. With meringue, you can eat a whole lot and still feel great. Also, you don’t have to worry about salmonella with this meringue! You make an easy sugar syrup that you beat into the egg white mixture. This hot syrup “cooks” the eggs, but it still keeps its fluffy texture. And let’s not even get started on the filling. Three words: so, so, good. Believe us, it will take some self control to get all of it into the pie crust instead of your mouth. But if you do, it’s so worth it. By the way, this would definitely be a great dessert for Easter! But whenever you do it, just make this pie. You will not regret it. To make the crust, mix the flour, sugar and salt in the bowl of a stand mixer fitted with the paddle attachment. Blend briefly. Add in the butter pieces and mix on medium-low speed until the mixture resembles coarse sand and the largest butter pieces are about the size of peas. Mix in the cold water on low speed just until the dough comes together. Shape the dough into a ball, wrap in plastic wrap, and chill in the refrigerator for at least 30 minutes. Remove from the refrigerator. Roll out the dough on a lightly floured work surface. Lift it into your ungreased pie plate. Prick it a couple of times with a fork. Line the crust with foil and fill with pie weights or dried beans. Bake at 400˚ F for about 15-20 minutes. Remove the weights and the foil and bake until golden, another 5-10 minutes. Let cool. To make the pastry cream, combine the milk and half-and-half in a medium saucepan over medium heat. Add 1 1/2 cups coconut flakes. Scrape the seeds from the vanilla bean; stir seeds and pod into milk mixture. Bring the milk mixture to a simmer and immediately remove from heat. Cover and let stand for 15 minutes. Strain through sieve into a bowl. Press on the coconut solids to release all of the moisture. Discard the coconut. Combine 2/3 cup sugar, cornstarch, salt, and egg yolks in a large bowl, stirring with a whisk. Gradually add the milk mixture to egg yolk mixture, stirring constantly. Return mixture to the pan and bring to a boil, whisking constantly. Remove from heat. Add butter and whisk until smooth. Place pan in a large ice-filled bowl for 6 minutes, stirring to cool. However, you can also chill the pastry cream for at least an hour in the fridge, stirring occasionally. Pour the cream into the prepared crust. Cover and chill for at least 1 hour. For the meringue, place the 3 egg whites and cream of tartar in a large bowl. Beat with a mixer at high speed until soft peaks form. Don’t over-beat! Meanwhile, combine 1/2 cup sugar and 1/4 cup water in a saucepan; bring to a boil. Cook, without stirring, until a candy thermometer registers 250°. Pour the hot sugar syrup in a thin stream over egg whites, beating at high speed until thick and fluffy. Spread the meringue over pie. Cover and refrigerate for at least 2 hours. Top with toasted coconut before serving. Enjoy! 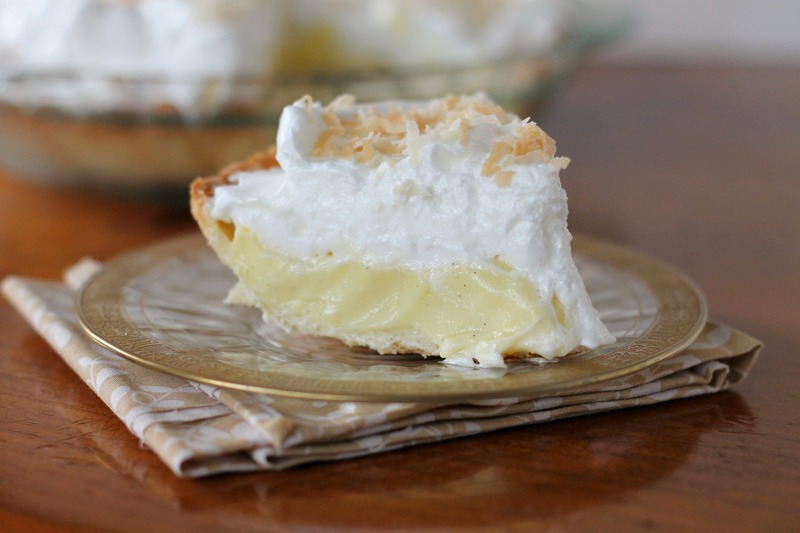 I’ve truly had coconut cream pie on my mind lately. I saw your latest post on your comment at Sally’s Baking Addiction and had to check it out. It looks amazing, and I would love some! Thank you! It’s a pretty delicious pie; let us know if you try it! 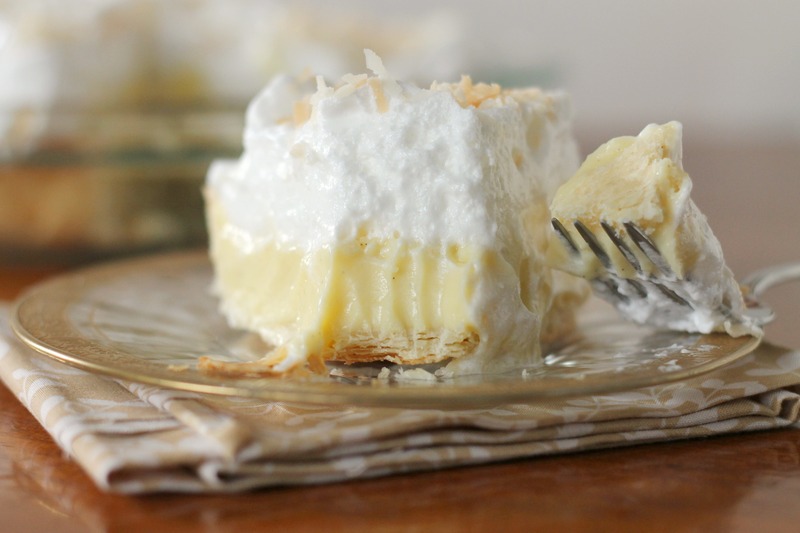 i love coconut cream pie! it’s been way too long since i’ve had it though. the whipped cream topping is my favorite part, but that meringue looks even better! Same with us, we hadn’t had it in ages! Don’t worry, you don’t really miss the whipped cream in this pie!